Nacomi Hair Growth 4 Extract 4 Oils is (as the name indicates) hair oil based on four herbal extracts and exact same amount of natural oils. This is very curious combination and quite unusual for other products. Nacomi believes in the balance between heavy oils and light vegetable extracts. Therefore, there are two groups of substance that work for hair. Plant extracts from nettle, common horsetail, fenugreek and ginger. Right next to precious extracts are also vegetable oils, such as black seed oil, argan oil, tamanu oil and castor oil. What deserves an applause in Nacomi Natural Mask Hair Growth is its entirely natural composition with no preservatives, silicon, fragrances or other substances of this sort. On top of that, cosmetic was enriched with vitamin E, i.e. antioxidant. Properties of Nacomi Hair Growth 4 Extract 4 Oils hair oil are very interesting. Most of all, this oil hair mask for scalp is expected to limit hair loss and stimulate hair growth. After few months of regular use of Nacomi Natural Mask with oils for hair growth enhancement and vegetable extracts, hair should be stronger, healthier and much denser. It provides volume, elasticity and strengthening from the roots. Herbal complex was selected in a way that allows solution to the problem at its source. It all starts with strengthening of hair bulbs to root them better in the follicles and stimulate them to produce much healthier, thicker and longer hair. Regular scalp oil treatment with Nacomi Natural Mask Hair Growth will make hair appear denser. What is the formula like? Nacomi Natural Mask Hair Growth is a combination of 4 herbal extracts and 4 vegetable oils, that were locked in a slim glass bottle. As far as the cosmetic looks nice, the grip of heavy glass bottle with greasy hands can end up pretty bad. Luckily, application is made a little bit easier by the convenient pump made of good quality plastic. 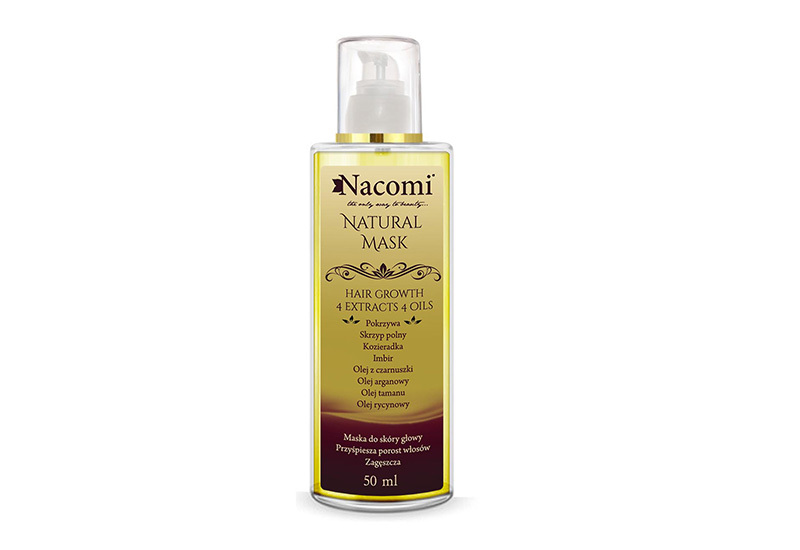 Hair growth stimulating oil from Nacomi is called a hair mask, but it is just a mix of oils and herbs. This impacts the consistency. Nacomi 4 Extract 4 Oils has liquid, oily and a bit greasy formula with green and yellow colour and very herbal smell. Many women may not like the aroma, because Nacomi oil smells a bit like a chicken soup, which is a merit of fenugreek.